Irrigate within 15 minutes of laying the first slab of turf. Hand watering to saturation (approximately 25mm) will help with turf establishment after installation. Follow up irrigation over the entire lawn twice a day for the next 10 days is important for root system establishment. During hot daylight hours the leaf should not be allowed to dry out and edge areas near concrete or brick borders will suffer the most. Curling and grey colour of the leaf will tell you when the turf has dried out. 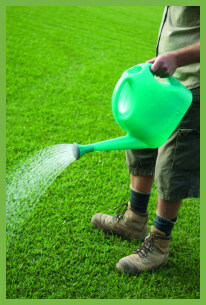 Once established, irrigating twice per week will maintain a healthy lawn. If hot and/or windy, extra watering will be required and each site will have different water requirements depending on soil type, drainage, etc.